Because my kitchen is currently in boxes for the next 8 days (and I am unable to participate in this week's Tuesdays With Dorie baking challenge as a result), I figured I would use this time to share some fun foodie finds from the recent trade show I attended. I'd love to hear your thoughts on these reviews so please feel free to comment on whether you could see yourself using the products, what you like/don't like, etc! Remember the fun Brownie pan that satisfied all those brownie edge lovers? You know who you are... you jump at the chance for the edge pieces so you get that nice, crunchy edge mixed in with the perfect fudge-like middle? We love homemade, hot-from-the-oven lasagna. It’s one of those dishes that just always seems to taste better when you bake it yourself. And with our new lasagna pan, it’ll be easy to make. Simply drop four noodles into the pan (adding sauce and cheese) to create each layer. Most brands of noodles will fit perfectly, right out of the box. 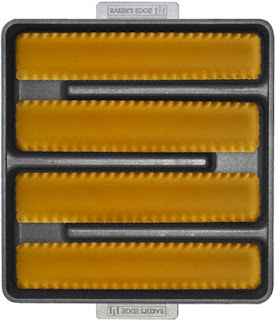 The pan’s interior will circulate heat evenly to every serving, and as the servings are removed, the sidewalls will prevent the remaining layers from sliding. In a conventional pan, leftover lasagna usually looks like it was... well, leftover. (If it’s still recognizable as lasagna, that is.) In our pan those delicious layers won’t slump or slide. Even the last serving will look, and taste, as good as the first. If you’re wondering about those little “gaps” between the dry noodles in the photo above, don’t worry – as the noodles absorb moisture from the sauce, they’ll expand and snug together. You’ll end up with a delicious, evenly-baked lasagna and a pan full of picture-perfect servings. Our new lasagna pan will also be versatile. Your homemade vegetable casseroles, manicotti, scalloped potatoes, macaroni and cheese, and zesty herb stuffing will bake thoroughly and evenly from edge to edge. The pan will be both wider and deeper than our original Edge Brownie Pan, and big enough to satisfy a dozen or more hearty appetites. It will feature the same, heavy-gauge cast aluminum construction, premium nonstick coating, and easy-to-grab recessed handles. YES - it is coming soon. Due to our overbearing desire for perfection, the official launch date has been readjusted to March 2009. If it happens sooner... you will see it here first. Thanks for your patience. 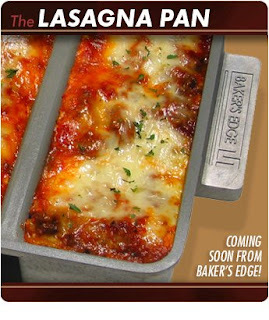 The Baker's Edge Brownie Pan was a hit when they came out... what do you anticipate the reactions will be when the Baker's Edge Lasagna Pan becomes available? Would you purchase this item? Why or why not? I love my Edge brownie pan, and I would totally buy this one. I think the edges are the best part! I'm not so sure about the lasagna pan. Though the brownie pan is definitely on my list of "must try." Interesting concept. I have never seen anything like this!!! Great Review!! Thanks so much! Hmm... I don't love super-specialized bakeware, but this I might try. I like my lasagne with tons of sauce, which makes it slidey, if you will. This would solve that issue! This pan has made me think of my little bread loaf pans and if they could pull double duty to do the same thing and then I wouldn't have to make a full batch. I would totally consider buying something like this. I love edges, and I think macaroni and cheese baked in this pan would be wonderful. Give me all the crispy edges possible! How is the move going? I am in the process (actually I'm taking a break as I type this) of packing up my own kitchen. I can't wait to get unpacked and be able to cook again! 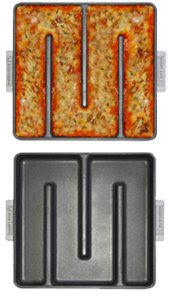 I like the idea of the lasagna not sliding around once you cut it, but I don't know that I would buy this pan. I tend to overload my lasagna and I don't know that I could fit it all in! Plus, like previous posters have said, I don't have much space and there are so many other tools that I'd rather have instead to take up that space in my kitchen. hmmm that's neat. couldn't you just use the brownie edge pan for this purpose too though? then you wouldn't need to get another pan! Interesting to use it as a lasagna pan, I would buy that.